The Battle of Quebec was fought on the night of December 30/31, 1775 during the American Revolution (1775-1783). Beginning in September 1775, the invasion of Canada was the first major offensive operation conducted by American forces during the war. Initially led by Major General Philip Schuyler, the invading force departed Fort Ticonderoga and commenced an advance down (northward) the Richelieu River toward Fort St. Jean. Initial attempts to reach the fort proved abortive and an increasingly ill Schuyler was compelled to turn over command to Brigadier General Richard Montgomery. A distinguished veteran of the French and Indian War, Montgomery resumed the advance on September 16 with 1,700 militia. Arriving at Fort St. Jean three days later, he laid siege and forced the garrison to surrender on November 3. Though a victory, the length of the siege badly delayed the American invasion effort and saw many suffer from sickness. Pressing on, the Americans occupied Montreal without a fight on November 28. To the east, a second American expedition fought its way north through the Maine wilderness. Organized by Colonel Benedict Arnold, this force of 1,100 men had been picked from the ranks of General George Washington's Continental Army outside Boston. Proceeding from Massachusetts to the mouth of the Kennebec River, Arnold had expected the trek north through Maine to take around twenty days. This estimate was based on a rough map of the route developed by Captain John Montresor in 1760/61. Moving north, the expedition soon suffered due to the poor construction of their boats and the faulty nature of Montresor's maps. Lacking adequate supplies, starvation set in and the men were reduced to eating shoe leather and candle wax. Of the original force, only 600 eventually reached the St. Lawrence. Nearing Quebec, it quickly became clear that Arnold lacked the men needed to take the city and that the British were aware of their approach. Withdrawing to Pointe aux Trembles, Arnold was forced to wait for reinforcements and artillery. On December 2, Montgomery descended the river with around 700 men and united with Arnold. Along with reinforcements, Montgomery brought four cannon, six mortars, additional ammunition, and winter clothing for Arnold's men. Returning to the vicinity of Quebec, the combined American force laid siege to the city on December 6. At this time, Montgomery issued the first of several surrender demands to the Governor-General of Canada, Sir Guy Carleton. These were dismissed out of hand by Carleton who instead looked to improve the city's defenses. Outside of the city, Montgomery endeavored to construct batteries, the largest of which was completed on December 10. Due to the frozen ground, it was constructed from blocks of snow. Though a bombardment commenced, it did little damage. As days passed, Montgomery and Arnold's situation became increasingly desperate as they lacked the heavy artillery to conduct a traditional siege, their men's enlistments would soon be expiring, and British reinforcements likely would arrive in the spring. Seeing little alternative, the two began planning an attack on the city. They hoped that if they advanced during a snowstorm, they would be able to scale Quebec's walls undetected. Within its walls, Carleton possessed a garrison of 1,800 regulars and militia. Aware of American activities in the area, Carleton made efforts to enhance the city's formidable defenses by erecting a series of barricades. To assault the city, Montgomery and Arnold planned on advancing from two directions. Montgomery was to attack from the west, moving along the St. Lawrence waterfront, while Arnold was to advance from the north, marching along the St. Charles River. The two were to reunite at point where the rivers joined and then turn to attack the city wall. To divert the British, two militia units would make feints against Quebec's western walls. Moving out on December 30, the assault began after midnight on the 31st during a snowstorm. Advancing past the Cape Diamond Bastion, Montgomery's force pressed into the Lower Town where they encountered the first barricade. Forming to attack the barricade's 30 defenders, the Americans were stunned when the first British volley killed Montgomery. In addition to killing Montgomery, the volley struck down his two chief subordinates. With their general down, the American attack faltered and the remaining officers ordered a withdrawal. Unaware of Montgomery's death and the attack's failure, Arnold's column pressed on from the north. Reaching the Sault au Matelot, Arnold was hit and wounded in the left ankle. Unable to walk, he was carried to the rear and command was transferred to Captain Daniel Morgan. Successfully taking the first barricade they encountered, Morgan's men moved into the city proper. Continuing the advance, Morgan's men suffered from damp gunpowder and had difficulty navigating the narrow streets. As a result, they paused to dry their powder. With Montgomery's column repulsed and Carleton's realization that the attacks from the west were a diversion, Morgan became the focus of the defender's activities. British troops counterattacked in the rear and retook the barricade before moving through the streets to surround Morgan's men. With no options remaining, Morgan and his men were forced to surrender. 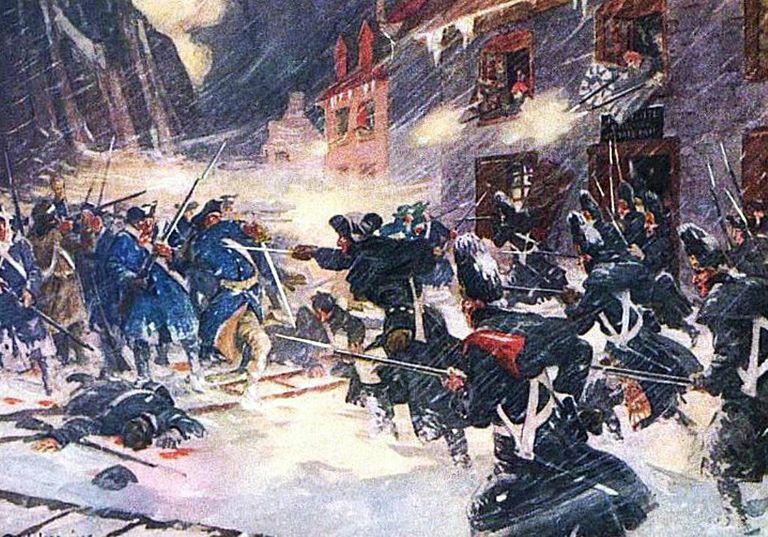 The Battle of Quebec cost the Americans 60 dead and wounded as well as 426 captured. For the British, casualties were a light 6 killed and 19 wounded. Though the assault failed, American troops remained in the field around Quebec. Rallying the men, Arnold attempted to lay siege to the city. This proved increasingly ineffective as men began to desert following the expiration of their enlistments. Though he was reinforced, Arnold was forced to fall back following the arrival of 4,000 British troops under Major General John Burgoyne. After being defeated at Trois-Rivières on June 8, 1776, American forces were forced to retreat back into New York, ending the invasion of Canada.